Has anyone ever told you that your life changes when you have kids? Oh, they have? Okay, I just needed to be sure that you were aware of this. It’s a funny thing, finding out you’re going to be a parent. Terrifying, even. You find out that in nine short months, you’re going to have this little life to care for, to nurture, to raise, to guide, to teach, to love. You’ve never taken care of anything before in your life, save for a pet, most likely. So, what do you do? You read, you talk to other parents, and, really, you figure it out as you go. You realize that you and your spouse aren’t alone in this parenting game. For us, we’ve had the joys of having a good number of our best friends have kids in the same time that we’ve had Sophia and Maddie. Actually, almost all of my best buddies from college have kids now.I may have mentioned this in a post before, I can’t remember, but one of them, my buddy Zach, who I’ve been friends with for almost 14 years (since we were roomed together our freshman year of college) found out that he and his wife would be having a baby about a month after we found out Sarah was pregnant with Sophia. We planned an arranged marriage between Sophia and his son Bryson, before we knew what the gender of either of our children would be. That story is strange, funny, and awesome all in one. In a conversation, he and I decided we’d arrange the marriage. Then, on a car ride down to DC, I told Sarah of the plan. Not even 15 minutes, without talking to me first, Zach texts Sarah the same exact thing. Kind of eery in a way, but awesome. One of many interesting conversations we’ve had as dads. Being a parent at the same time as your friends, especially your best friends, really makes things so much more fun. The texts, pictures, calls, and stories that fly back and forth on a daily basis are highly entertaining. That’s actually what pushed me to write this post. 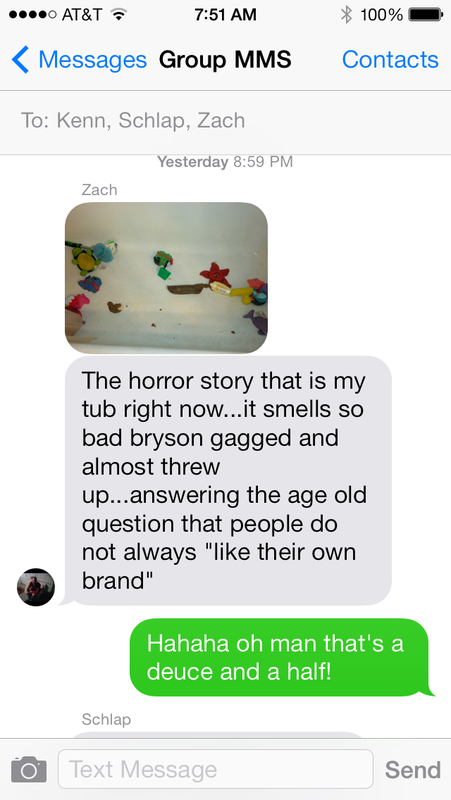 A group text conversation from last night, initiated by a little adventure Zach’s son had in the tub. You can see in the picture to the right, just exactly what I’m talking about. And if you wanna see a toddler’s poop in a tub, go ahead and click on the image. 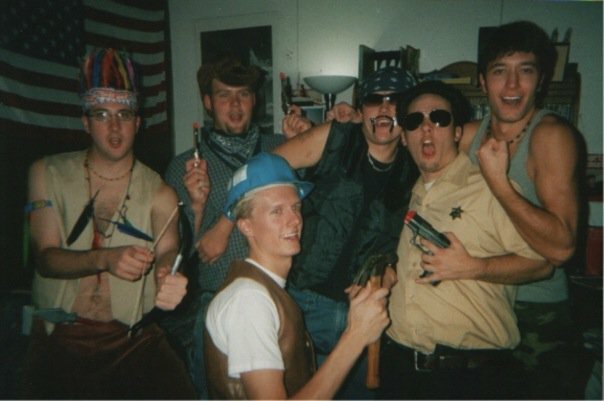 The conversation that followed was a mixture of laughing at the picture, mixing college stories with the present, and just laughing at the hilarity of the situation. We’ve all been out of college going on 10 years now, and we still talk about the stupid things we did, the funny stories, and ridiculous jokes as if they happened yesterday. And something tells me that the older we get, the more we’ll continue to share those stories, and relate them to our lives as parents. Many of Sarah’s best friends from college have kids now, as well. She gets to have the same conversations with her girls, as I have with my boys. We’re all living through the same situations in our lives at the same time, and aside from the laughs, we offer each other support. Phone calls and texts during pregnancies, during births, and on late sleepless nights. I haven’t even mentioned the fact that all of our kids get to grow, play, and laugh together, just like we’ve all been doing for the last 14 years. One day, our big plan of all living on the same block will come to fruition and our kids will follow us and all go to college together. Circle of life, my friends, circle of life. Okay, so maybe that won’t happen, but we can dream, can’t we? Like I said, parenting is way more fun when you do it with your friends. You’re pretty lucky you have all those guys nearby. For me, I don’t get to see my friends too often because a few moved away, and other times it’s just hard to get together. You’d think with kids it’d be easier but so far we haven’t gotten together as much as I’d like. Still, I like being able to call/chat/text them any time and talk parent talk. Glad you enjoyed it Nina! Actually we all live at least an hour from each other, but we still see each other a couple times a year. It definitely influences the relationship/friendship. You both are going through similar things and it is nice to have someone to talk about it with. One challenge is that it is hard not to compare. This can lead to problems. We haven’t run into the comparisons, at least not that I’m aware of. At this point, it’s all about the laughs and support when needed.